Spur gears or straight-cut gears are the simplest type of gear. They consist of a cylinder or disk with teeth projecting radially. Though the teeth are not straight-sided (but usually of special form to achieve a constant drive ratio, mainly involute but less commonly cycloidal), the edge of each tooth is straight and aligned parallel to the axis of rotation. These gears mesh together correctly only if fitted to parallel shafts. No axial thrust is created by the tooth loads. Spur gears are excellent at moderate speeds but tend to be noisy at high speeds. 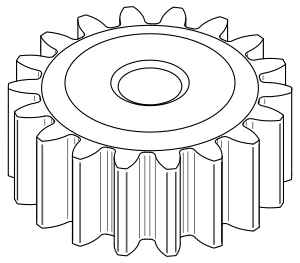 Helical or "dry fixed" gears offer a refinement over spur gears. The leading edges of the teeth are not parallel to the axis of rotation, but are set at an angle. Since the gear is curved, this angling makes the tooth shape a segment of a helix. Helical gears can be meshed in parallel or crossed orientations. The former refers to when the shafts are parallel to each other; this is the most common orientation. In the latter, the shafts are non-parallel, and in this configuration the gears are sometimes known as "skew gears". The angled teeth engage more gradually than do spur gear teeth, causing them to run more smoothly and quietly. With parallel helical gears, each pair of teeth first make contact at a single point at one side of the gear wheel; a moving curve of contact then grows gradually across the tooth face to a maximum, then recedes until the teeth break contact at a single point on the opposite side. In spur gears, teeth suddenly meet at a line contact across their entire width, causing stress and noise. Spur gears make a characteristic whine at high speeds. For this reason spur gears are used in low-speed applications and in situations where noise control is not a problem, and helical gears are used in high-speed applications, large power transmission, or where noise abatement is important. The speed is considered high when the pitch line velocity exceeds 25 m/s. 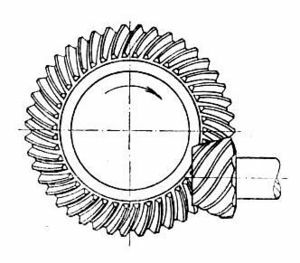 A disadvantage of helical gears is a resultant thrust along the axis of the gear, which must be accommodated by appropriate thrust bearings, and a greater degree of sliding friction between the meshing teeth, often addressed with additives in the lubricant. Double helical gears and herringbone gears are similar, but the difference is that herringbone gears do not have a groove in the middle like double helical gears do. Double helical gears overcome the problem of axial thrust presented by single helical gears by using two sets of teeth that are set in a V shape. A double helical gear can be thought of as two mirrored helical gears joined together. This arrangement cancels out the net axial thrust, since each half of the gear thrusts in the opposite direction, resulting in a net axial force of zero. This arrangement can remove the need for thrust bearings. However, double helical gears are more difficult to manufacture due to their more complicated shape. For both possible rotational directions, there exist two possible arrangements for the oppositely-oriented helical gears or gear faces. One arrangement is stable, and the other is unstable. In a stable orientation, the helical gear faces are oriented so that each axial force is directed toward the center of the gear. 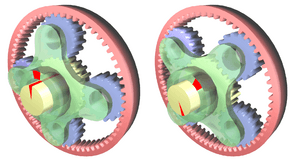 In an unstable orientation, both axial forces are directed away from the center of the gear. In both arrangements, the total (or net) axial force on each gear is zero when the gears are aligned correctly. If the gears become misaligned in the axial direction, the unstable arrangement generates a net force that may lead to disassembly of the gear train, while the stable arrangement generates a net corrective force. If the direction of rotation is reversed, the direction of the axial thrusts is also reversed, so a stable configuration becomes unstable, and conversely. 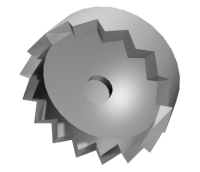 A bevel gear is shaped like a right circular cone with most of its tip cut off. When two bevel gears mesh, their imaginary vertices must occupy the same point. Their shaft axes also intersect at this point, forming an arbitrary non-straight angle between the shafts. The angle between the shafts can be anything except zero or 180 degrees. Bevel gears with equal numbers of teeth and shaft axes at 90 degrees are called miter gears. Spiral bevel gears can be manufactured as Gleason types (circular arc with non-constant tooth depth), Oerlikon and Curvex types (circular arc with constant tooth depth), Klingelnberg Cyclo-Palloid (Epicycloid with constant tooth depth) or Klingelnberg Palloid. Spiral bevel gears have the same advantages and disadvantages relative to their straight-cut cousins as helical gears do to spur gears. Straight bevel gears are generally used only at speeds below 5 m/s (1000 ft/min), or, for small gears, 1000 r.p.m. Note: The cylindrical gear tooth profile corresponds to an involute, but the bevel gear tooth profile to an octoid. All traditional bevel gear generators (like Gleason, Klingelnberg, Heidenreich & Harbeck, WMW Modul) manufacture bevel gears with an octoidal tooth profile. IMPORTANT: For 5-axis milled bevel gear sets it is important to choose the same calculation / layout like the conventional manufacturing method. Simplified calculated bevel gears on the basis of an equivalent cylindrical gear in normal section with an involute tooth form show a deviant tooth form with reduced tooth strength by 10-28% without offset and 45% with offset [Diss. Hünecke, TU Dresden]. Furthermore, the "involute bevel gear sets" cause more noise. Hypoid gears resemble spiral bevel gears except the shaft axes do not intersect. The pitch surfaces appear conical but, to compensate for the offset shaft, are in fact hyperboloids of revolution. Hypoid gears are almost always designed to operate with shafts at 90 degrees. 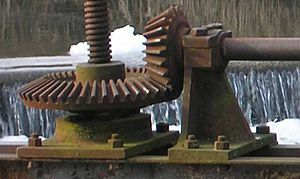 Depending on which side the shaft is offset to, relative to the angling of the teeth, contact between hypoid gear teeth may be even smoother and more gradual than with spiral bevel gear teeth, but also have a sliding action along the meshing teeth as it rotates and therefore usually require some of the most viscous types of gear oil to avoid it being extruded from the mating tooth faces, the oil is normally designated HP (for hypoid) followed by a number denoting the viscosity. Also, the pinion can be designed with fewer teeth than a spiral bevel pinion, with the result that gear ratios of 60:1 and higher are feasible using a single set of hypoid gears. This style of gear is most common in motor vehicle drive trains, in concert with a differential. 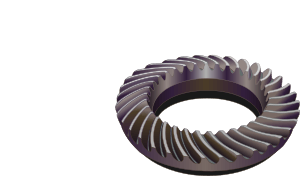 Whereas a regular (nonhypoid) ring-and-pinion gear set is suitable for many applications, it is not ideal for vehicle drive trains because it generates more noise and vibration than a hypoid does. Bringing hypoid gears to market for mass-production applications was an engineering improvement of the 1920s. Worms resemble screws. 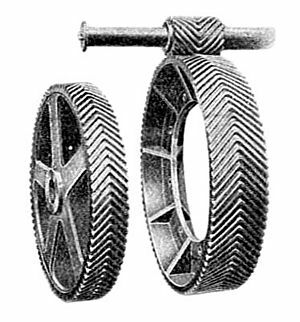 A worm is meshed with a worm wheel, which looks similar to a spur gear. A worm gear is a species of helical gear, but its helix angle is usually somewhat large (close to 90 degrees) and its body is usually fairly long in the axial direction. These attributes give it screw like qualities. The distinction between a worm and a helical gear is that at least one tooth persists for a full rotation around the helix. If this occurs, it is a 'worm'; if not, it is a 'helical gear'. A worm may have as few as one tooth. If that tooth persists for several turns around the helix, the worm appears, superficially, to have more than one tooth, but what one in fact sees is the same tooth reappearing at intervals along the length of the worm. The usual screw nomenclature applies: a one-toothed worm is called single thread or single start; a worm with more than one tooth is called multiple thread or multiple start. The helix angle of a worm is not usually specified. Instead, the lead angle, which is equal to 90 degrees minus the helix angle, is given. In a worm-and-gear set, the worm can always drive the gear. However, if the gear attempts to drive the worm, it may or may not succeed. Particularly if the lead angle is small, the gear's teeth may simply lock against the worm's teeth, because the force component circumferential to the worm is not sufficient to overcome friction. 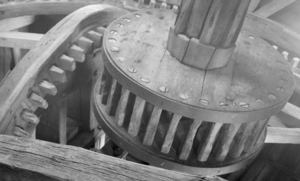 In traditional music boxes, however, the gear drives the worm, which has a large helix angle. This mesh drives the speed-limiter vanes which are mounted on the worm shaft. If the gear in a worm-and-gear set is an ordinary helical gear only a single point of contact is achieved. 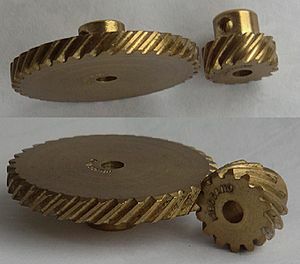 If medium to high power transmission is desired, the tooth shape of the gear is modified to achieve more intimate contact by making both gears partially envelop each other. This is done by making both concave and joining them at a saddle point; this is called a cone-drive or "Double enveloping". 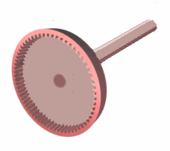 Non-circular gears are designed for special purposes. While a regular gear is optimized to transmit torque to another engaged member with minimum noise and wear and maximum efficiency, a non-circular gear's main objective might be ratio variations, axle displacement oscillations and more. Common applications include textile machines, potentiometers and continuously variable transmissions. A rack is a toothed bar or rod that can be thought of as a sector gear with an infinitely large radius of curvature. Torque can be converted to linear force by meshing a rack with a pinion: the pinion turns; the rack moves in a straight line. Such a mechanism is used in automobiles to convert the rotation of the steering wheel into the left-to-right motion of the tie rod(s). Racks also feature in the theory of gear geometry, where, for instance, the tooth shape of an interchangeable set of gears may be specified for the rack, (infinite radius), and the tooth shapes for gears of particular actual radii are then derived from that. The rack and pinion gear type is employed in a rack railway. In epicyclic gearing one or more of the gear axes moves. Examples are sun and planet gearing (see below), cycloidal drive, and mechanical differentials. Sun and planet gearing is a method of converting reciprocating motion into rotary motion that was used in steam engines. James Watt used it on his early steam engines to get around the patent on the crank, but it also provided the advantage of increasing the flywheel speed so Watt could use a lighter flywheel. 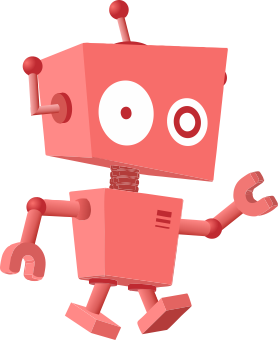 In the illustration, the sun is yellow, the planet red, the reciprocating arm is blue, the flywheel is green and the driveshaft is gray. A cage gear, also called a lantern gear or lantern pinion has cylindrical rods for teeth, parallel to the axle and arranged in a circle around it, much as the bars on a round bird cage or lantern. The assembly is held together by disks at each end, into which the tooth rods and axle are set. Cage gears are more efficient than solid pinions, and dirt can fall through the rods rather than becoming trapped and increasing wear. They can be constructed with very simple tools as the teeth are not formed by cutting or milling, but rather by drilling holes and inserting rods. All cogs of each gear component of magnetic gears act as a constant magnet with periodic alternation of opposite magnetic poles on mating surfaces. 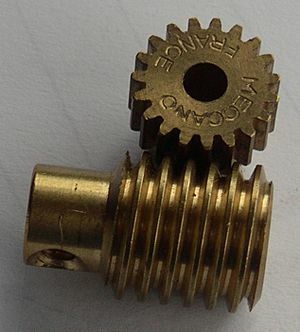 Gear components are mounted with a backlash capability similar to other mechanical gearings. Although they cannot exert as much force as a traditional gear, such gears work without touching and so are immune to wear, have very low noise and can slip without damage making them very reliable. They can be used in configurations that are not possible for gears that must be physically touching and can operate with a non-metallic barrier completely separating the driving force from the load. The magnetic coupling can transmit force into a hermetically sealed enclosure without using a radial shaft seal, which may leak. Gear Facts for Kids. Kiddle Encyclopedia.